This is a beautiful high definition picture of two red roses. 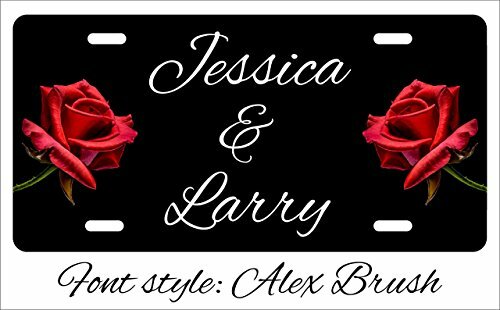 You can turn this into a Personalized License Plate by adding your name or any other text. Keep in mind the more you write the smaller it gets. The customized license plate is made in the USA. It's high gloss aluminum with UV plus for extended outdoor protection. The coating is professionally applied - not a primitive roller coat. It is made from aluminum so it will never rust. Our process is done with heat (not stick on vinyl) so the image will not peel or crack. The license plate is a standard size of 6" x 12" x .025" with standard mounting holes. The mounting screws are not included but can be purchased at any auto parts store. If you have any questions about this product by JSDGifts, contact us by completing and submitting the form below. If you are looking for a specif part number, please include it with your message.